This weekend I visited Bia Bistrot on Colinton Road in Morningside for the first time since diagnosis four years ago. I had always loved the place and was thrilled to get a recommendation about its gluten free choices, so now was the time to give it a go. My verdict? Put Bia Bistrot at the top of your South Edinburgh gluten free restaurant list! The choices are amazing, the staff are super-careful and the food is amazing. I was dining in a group, which can be nerve-wracking as without wanting to make a fuss, you still need to ensure the staff are aware of what’s going on. However, I could not have been more confident that I was in good hands. Probably 80% of the menu is fine for coeliacs and tiny tweaks make even more of it okay. 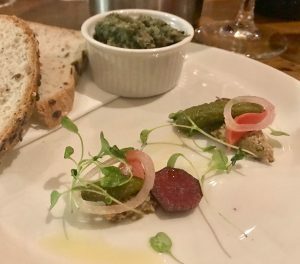 For my starter I enjoyed lentil and onion pate with some beautiful little accompaniments: mustard, onions, beetroot and a tiny gherkin. There was GF bread on the side and the pate was great. I could have had any number of other tasty looking treats, including pigeon, pheasant, soup – it was all fine. 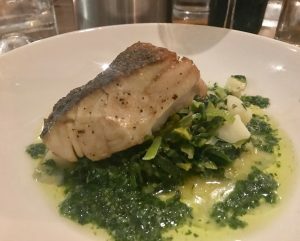 For mains I chose a special of coley on a bed of leeks and pesto with some nice little potatoes. The side dishes of roasted roots and potatoes were also fine, as were almost all of the main choices – there was some nice looking duck! I may have struggled if I was vegetarian and I spotted some spelt and barley options, but it was simple for the team to make changes. The extra reminder from the server that she was giving me my “gluten free cod” does just bring reassurance. I am usually too full for pudding but on being told that everything bar one item was gluten free, including three types of cake, what else could I do? I was glad I did and had an amazing apple and almond cake with butterscotch sauce and creme fraiche. What choices! I could have had other cakes including orange and polenta, fennel and almond, plus ice creams with sauce and something chocolatey. A truly brilliant spread. Bia Bistrot serves interesting wine and the service is good. It’s a small place, but had atmosphere and a Saturday night buzz. It was a bit warm, but I can live with that based on the choice available from a high quality menu. If you are looking for top whack food and just the finest GF around, give it a go!